Secure your user's information with greater control over password requirements. Check the Set password policy box on the Authentications card. Must change password after: This duration can be set in various units (days, years, months, etc.) and must be entered using International Organization for Standardization (ISO) designators (see section below). Cannot reuse passwords for: This duration can be set in various units (days, years, months, etc.) and must be entered using ISO designators (see section below). Lockout lasts for: This duration can be set in various units (days, years, months, etc.) and must be entered using ISO designators (see section below). You can manually override password lockouts if necessary. Will this setting at the domain level automatically filter down to all the subdomains, or is it strictly for this one domain? Hey Candi, it trickles down to subdomains unless that subdomain explicitly has a different password policy defined. 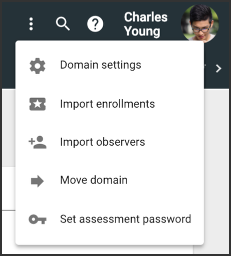 Is there a way to require that students change their password after the first time they log in? Please let me know. If you mean is there a way by which to force a student to change their password after first signing on. There currently is not a way within the UI to accomplish this. 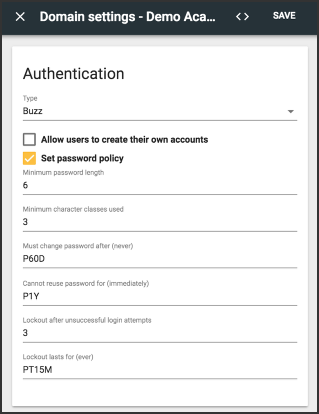 This would require the API to force a student password change after signing on into Buzz. If additional assistance is needed with the API, please (through your authorized support agent) submit a ticket to Agilix Support.